The fairytale world of Lake Bled, with its island church and clifftop castle, will be your starting point, before cycling onwards through the majestic Julian Alps, over a high pass and down into the western valleys. Alpine meadows soon give way to terraced hills dotted with vineyards that lead you all the way into Italy and towards the coast, where lazy promenades and beautiful Venetian architecture await you. This is a cycling holiday for people who want the perfect mix of amazing landscapes, great food and wine, and historical sights. Day 1: Arrival at Lake Bled. (**** hotel). To begin with, you can dip your feet in the beautiful glacial Lake Bled. This shimmering body of water is famous for its distinctive island church and the clifftop castle all backed by the beautiful Karavanke Mountains. Bled is one of Slovenia’s most popular tourist attractions. You can take a stroll around the western side of the lake for some of the best views and photographs, and then have lunch and the locally famous cream cake (Kremšnita) on the eastern lakeside while watching the sunset over the mountains. Day 2: Bled to Bohinjska Bistrica (27km / 43km with side trip). (***** spa hotel). A short car transfer leaves you on the high plateau at Pokljuka. From here you'll cycle through alpine villages to Lake Bohinj, the jewel of the Triglav National Park. Encircled by tall mountain peaks, Bohinj is the largest and deepest lake in the national park. Savica Waterfall is the source of the lake and the Sava Bohinjka River. A cable car runs up to Vogel Mountain, where you can get a spectacular view into the Bohinj Valley and of Mount Triglav, the highest peak in the Julian Alps. Day 3: Bohinj to Tomlin (*** guesthouse). (56km; or 35km if taking train to Podbrdo). In the morning you'll have two options. Your route will take you via the Sorica Pass over the Julian Alps, but if you want to save some climbing you can take a short train ride through the Bohinj tunnel to Podbrdo. Then you peddle off through a narrow valley and follow the beautiful emerald-green Soča River as it rushes out of the mountains and into the western side of the Julian Alps. Just before reaching your destination you'll have a chance to dive into its supernatural waters, or visit the only monument in the world dedicated to military cooks. Day 4: Tolmin to Smartno / Dobrovo (34km / 46km without lift up). *** small family hotel with a view. You will be car-transferred to Kolovrat Saddle - a million dollar viewpoint high above the Soča Valley. Once the site of heavy fighting during WW1, it's now a very interesting open-air museum. Reaching the first village, Mrs. Josephine, who lives all alone in an intact old-fashioned pub, will be overjoyed to welcome you in her shady garden. Cycling the ridges above two valleys, you'll reach your day's destination - Šmartno v Goriških Brdih, amid an abundance of lush vineyards. A recent and beautifully restored medieval village of narrow streets with Mediterranean houses, you can stretch your legs here, sip cool white wine and chat with locals in an authentic village pub. Day 5: Smartno to Grado (67km). *** family hotel. Day 6: Grando to Portogruaro (87km or 59km if shortened by train ride). *** family hotel. Day 7: Portogruaro to Lido di Jesolo (67km). *** resort hotel. From Portogruaro you can look forward to a wonderful easy cycle westwards along the beautiful beaches of the Adriatic Coast. There are numerous opportunities to relax and swim so be sure to pack your swim gear. You will stay overnight in one of the two towns along this famous coastline, depending on availability. Jesolo is a gateway to Venice, from here you can easily travel onward to the airport or old city on the lagoon. Day 8: Departure from Lido di Jesolo. After breakfast, your tour ends. However, you can prolong your stay or continue your trip by visiting ancient Serrenissima - Venice. 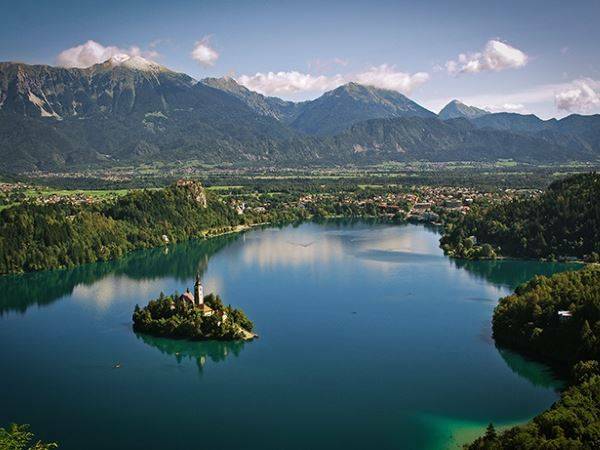 Cycle from Lake Bled onwards through the majestic Julian Alps, over a high pass and down into the western valleys. The alpine meadows soon give way to terraced hills dotted with vineyards that lead you all the way into Italy. This is a cycling holiday for people who want the perfect mix of amazing landscapes, great food and wine, and historical sights. Routes may be subject to change or alteration. All route notes, maps and day-by-day information will be given to you upon arrival at the first hotel or at the welcome meeting. GPS/GPX Files are available for most our the cycling holidays we offer. Please ask us for details. Getting to Bled: Personal transfer – our driver will be waiting at landing time in arrival hall with your name labelled. It is 30 min journey - cost: 30 €/person. (Pre-book at info@helia.si ) Taxis available outside airport building – prices vary a lot Bus – bus stop is outside airport building. Buy ticket on bus. Take a bus in direction: Kranj - cost 1,80 € - 15 min journey time table http://www.lju-airport.si/eng/passanger-visitors/getting-here/bus-and-shuttle. Then from Kranj to Bled – 3,60 € - 40 min journey time table http://www.ap-ljubljana.si/en/. Get off at Bled Hotel Jelovica station / main station. There are taxis available to take you (5 min) to your hotel, 2 km away. The Lake Bled to Venice cycling holiday includes the daily transfer of luggage to the next hotel and local support if required.